Alec Ryrie’s recent volume, Protestants, is an immense project that attempts to survey the impact of Protestantism over the past five hundred years. Ryrie is, himself, a licensed lay preacher in his Anglican church. He is also a professor of the history of Christianity at Durham University. Attempting a project this broad in scope is brave. In five hundred years, Protestantism has gone from a local attempt to correct theological errors of Roman Catholicism to a worldwide movement that has strong theological, social, and political emphases. Any project of such expansive scope will be subject to common criticisms that it makes generalizations, skips key points, and does not satisfy the desires of those with a pet theory about a topic. To cover every possible topic in perfect detail would have made this book tedious and impenetrable. Some of those criticisms are valid, however, and I will point to some areas of particular weakness in this review, but the book deserves consideration beyond such simple dismissals. Ryrie attacks his enormous task in three movements. In Part I he deals with the contours of the Reformation Era, beginning with Luther and considering the various reformations that spread through Europe. This was the strongest section of the volume, as Ryrie weaves together the threads of history into a representative tapestry. Part II focuses on what Ryrie calls the Modern Age, which includes Pietism, the sin of human slavery, American Protestantism, the rise of liberalism, the German Nazi crisis, and American religious politics. Clearly in this selection of topics, there is a great deal Ryrie skips. His selections show something of his intentions through the volume. In Part III, Ryrie addresses a handful of examples of Protestantism in various corners of the globe, including South Africa with a focus on Apartheid, Korea and its evolution of a prosperity gospel, Chinese Protestantism, and Pentecostalism. His Epilogue attempts to tell the future, revealing his hopeful anticipation of changes in Protestantism to come. With such an expansive topic and, possibly, a strong desire to get the volume finished during the year of the 500th anniversary of the Protestant Reformation, it is little surprising that Ryrie relies much more strongly on secondary and tertiary sources to write his volume. He includes some primary sources, but there are clear cases, as with his depiction of Zwingli’s understanding of the Lord’s Supper, that Ryrie sticks to the mainstream theories, which are obviously inaccurate to those who have read the primary source. Such an approach is understandable, but it severely limits Ryrie’s ability to deal with topics about which he is apparently largely unread. One such example is in Ryrie’s treatment of Fundamentalism. Though he opens the volume professing to attempt to treat movements fairly, writing, “Condemning ugly beliefs is easy, but it is also worth the effort to understand why people once believed them. If we are lucky, later ages might be as indulgent toward us. We all live in glass houses.” However, he dismisses Fundamentalism as a “mood” and not a doctrinal movement. In other words, Fundamentalism is a psychosis. These are the marks of someone who is critiquing a movement that he despises, has not bothered to research, and thus has not adequately considered. To say there are excesses in negative attitude among Fundamentalism is certainly true, but to dismiss the doctrinal heart of the Fundamentalist dispute with modernism is sloppy. Significantly absent from Ryrie’s lengthy tome is a chapter focused on the influence of Protestant missions. He engages in occasional discussions of the topic, but the central thrust of the volume is the sociological impact of Protestantism on history rather than on the concern for conversion. In fact, most of the discussions of missions in this volume are negative, describing missionaries in largely imperialistic terms, which is a sometimes-fair, but incomplete depiction. He largely skips the positive impacts that Protestant missionaries have had through their social reforms, and he certainly does not talk about the concern of so many Protestants to preach the gospel that many may not suffer the fires of Hell. Whether it is by design or default, Ryrie’s presents a Protestantism that is entirely devoid of the gospel which compelled Luther to seek reformation of faulty doctrines and inspired many to give their lives for their faith. The portrait that emerges from Ryrie’s Protestants is one of an ever-adapting religion that lags somewhat behind the cultural winds, but always follows. In fact, his Epilogue is a hopeful prediction that will be exactly the case. However, it should be clear that Ryrie’s portrait is not of the forms of Protestantism that still feel strongly connected to their roots in the Reformation. Rather, Ryrie argues that Protestantism “is not a doctrine or theology. Defining it that way is usually an attempt to exclude people. . .” That approach enables Ryrie to trace out the influence that Protestantism has as it has morphed and migrated throughout the world. If the purpose of the book is to survey how people who have been impacted by movements that were influenced by those who attempted to reshape Christianity half a millennium ago, then it has accomplished its purpose. Such a book would say little about the content of Protestantism and a great deal more about the social influence of an event. However, Ryrie’s purpose seems to be something more than that. The story that Ryrie is telling has a moral that begins to appear in his recounting of the evolution of liberalism. Ryrie makes his point explicit in the final pages of the book. One central theme is that it is not necessary to take the Bible too seriously to consider oneself a faithful Protestant. (His repeated bashing of inerrantists, whose actual beliefs he never considers, and Fundamentalists reveal this early on.) This leads to the more significant idea that Protestantism is descended from orthodox Christianity, but not significantly moored in that. Ryrie sees the liberalizing trend of culture as the final destination of all Protestant Christians. Thus, he seems to be saying, ethical revisionists should feel free to patronize churches (in both senses of the word) while the amorphous religion comes around to contemporary, culturally compatible doctrines. By ignoring evidence to the contrary, his conclusions are entirely plausible. 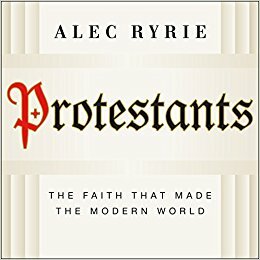 And, by ignoring the possibility that extensive changes can actually sever a movement from rightful claims to a historical root in the Reformation, Ryrie’s conclusions may indeed salvage an anemic form of Christianity in the eyes of those who long to see it shaped by the waves of culture. Ryrie is telling a story that sounds a great deal like Niebuhr’s category, “Christ of Culture.” If Protestantism is primarily a social movement, the Ryrie’s predictions may be accurate, but those seeking a theological interpretation will likely question his prognostications. Ryrie’s book is well written. The first part is quite well done, with engaging prose and even-handed interpretation. This is the sort of volume that will likely find its way onto a public library shelf, and which may serve as a launching point for a conversation. It will provide comfort to the culturally comfortable Protestant Christian, and potentially fuel criticism among those who want Christians concerned with historical orthodoxy to evolve faster. As such, this is the sort of volume one should read because of its potential for conversation in the plane or over the water cooler rather than as a normative interpretation of the history of Protestantism.